Aura Marina apartments is a complex of nine self-catered apartment-houses, built in the distinct traditional architectural style of Santorini. We are situated near the village of Akrotiri, on the south west side of the island, overlooking the volcanic caldera and with views to the town of Fira, and the villages of Pyrgos, Imerovigli and Oia. 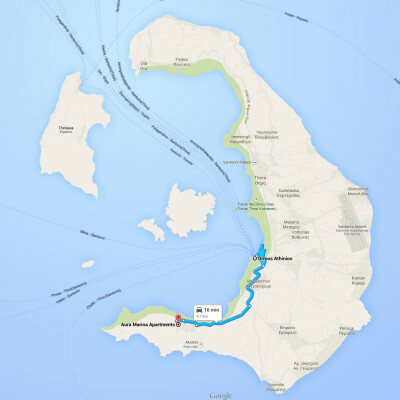 Our location is in a semi rural area, with a couple of taverns with home cooking and views to the caldera within walking distance, and a couple of grocery stores, a souvlaki stand and few restaurants, in the centre of the village of Akrotiri in a distance of 800 meters. The nearest beach, Kabia is 2 km away. The beaches of MesaPigadia and the famous Red Beach is a 5 minute ride from us while to get to the beaches of Perissa, Perivolos, Vlychada the car ride lasts maximum 10 minutes.From here to the capital, Fira, the distance is 12km ( a 15 min ride), 15km to Imerovigli, 25km to Oia ( a 35 min ride), and 28km to Kamari (a 25 min ride). Exit the airport area and arrive at the stop sign. Turn left and continue for about 1,7 km until you arrive at the Messaria cross section and eventual stop sign. There, you turn left to the direction of Perissa – Akrotiti (indicated by a sign). 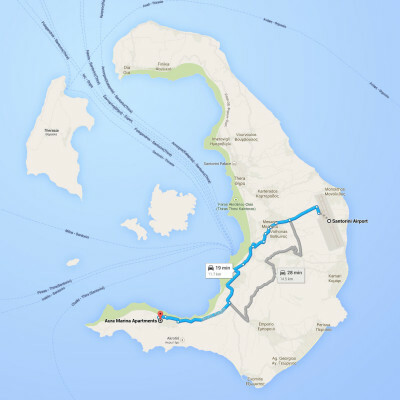 Continue for another 2,5 km where Segnor Zorba restaurant is, turn left and immediately right and uphill towards the direction of Perissa beach – Akrotiri. Continue for about 3 km until you arrive at the Akrotiri cross-section (on your left hand side you will see a big bakery) and turn right towards Akrotiri (indicated by a sign). Continue for another 2,5 km. At the crossroad turn right again in the direction of Kambia beach – Mesa Pigadia (indicated by a sign). After about 1 km and having passed Villa Maria pension house, make a left turn and continue for almost 100m. On your right hand side, you will see Aura Marina apartments. +30 6976 014 462 for any change in your arrival time. Exit the port and continue uphill for about 3,3 km until you arrive at the stop sign. There, you turn right to the direction of Perissa – Akrotiti (indicated by a sign). Continue for about 2,4 km until you arrive at the Akrotiri cross-section (on your left hand side you will see a big bakery) and turn right towards Akrotiri (indicated by a sign). Continue for another 2,5 km. At the crossroad turn right again in the direction of Kambia beach – Mesa Pigadia (indicated by a sign). After about 1 km and having passed Villa Maria pension house, make a left turn and continue for almost 100m. On your right hand side, you will see Aura Marina apartments.